I might not be able to bend yet, but I can still do jobs where I can stand! 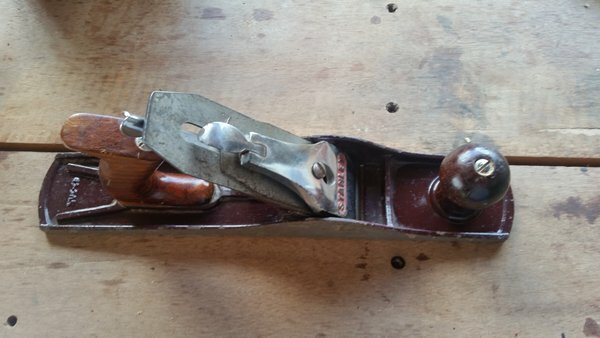 Last week, I picked up a second hand No.5 Hand Plane, it says it is a Stanley, but I can guarantee it isn't, it's a cheap Chinese copy, or had a Stanley lever cap inserted, by the previous owner, however that doesn't make it a bad plane. The body itself didn't need much work, just a clean. 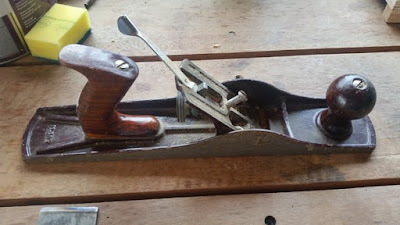 I also had to adjust the tilt blade lever, it is just cheap steel riveted to the body, and the bottom of the lever had moved, so it was not catching in the blade slot, a quick leverage with a screwdriver and it was working again. The blade itself was another matter, the ´previous owner, obviously had no idea whatsoever how to care for his/her tools, an attempt had been made to sharpen it on a bench grinder, it had overheated, turning the metal blue, therefore weakening it, and it was nowhere near square, as you can see! I therefore used the my bench grinder to carefully grinder the blade back beyond the blue, which meant removing just over 1/8". 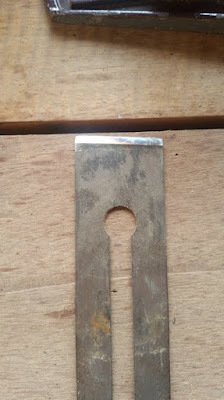 I then roughly put a new bevel on the blade, after which I moved to my oil stone, and spent an hour sharpening the blade by hand, using plenty of oil on the stone. 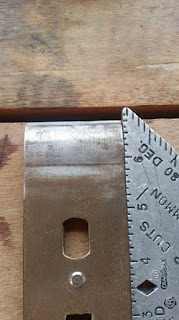 You can see that it is a near perfect 90° to the cap iron, sharp and ready for use! !